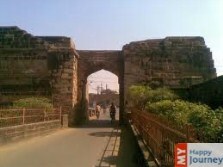 An ancient city at the concurrence of River Kathjuri and River Mahanadi, Cuttack boasts of wonderful history. Considered to be the second largest city in the state of Orissa, it is popularly known as “the cultural capital of Orissa”. This renowned city covers an area of 3932 sq. km and has been given many names. King Nrupa Keshari of the Keshari dynasty established this city as their cantonment. But in the year 1750, Marathas acquired this city and transformed it into a business centre. In 1803, British army captured it, under whose control Cuttack gained its historical importance. This city would always be remembered as the birth place of Subhash Chandra Bose who helped in gaining freedom from the British rulers. Various holy shrines such as Cuttack Chandi Temple, Singanatha Temple and Quadam-i-Rasool which houses different deities are present in the city. These temples are beautifully crafted and give a glimpse of Hindu, as well as Muslim style of Architecture. The charm of the city lies in its different festive celebrations. Festivals of all the religions are celebrated with equal pomp and show and throughout the year various festive celebrations can be witnessed at this place. Bali Yatra is an important trade festival that is organized in Cuttack. Being a shopper’s destination, travelers can also purchase cotton and silk fabrics from this city. Different monuments and museums which are present in the city give an impression of the country’s freedom movement. So visit this historical place and enjoy the vibrancy of this beautiful city.